Welcome to issue #3 of Jade Woodruff’s “Life on Anime” – a new column here at Nerd Nation dedicated to reviewing all of the great anime titles out there (of which there are many – as most of you reading this already know!) from the perspective of a life-long anime fan. For this installment, we will be tackling GlassLip a 13-episode mysterious slice-of-life anime by PA Works that aired in summer 2014. Touko Fukami’s family runs a glassware craft studio in a small harbor town. During the summer holidays, a new boy, Kakeru Okikura, joins their school. He tells Touko that he can hear voices from the future. Touko, too, begins seeing visions that seem to compliment Kakeru’s whenever she looks at shiny objects like the glass her in family’s studio. Touko’s a little absent minded and makes for a coy lead female who’s clueless about relationships. When the story picks up, she and her group of friends have established rules like always being in groups of three or more, no dating within the group, and an unstated rule that they don’t talk about the obvious if it could rock the boat. This group dynamic is ruptured with Kakeru’s introduction. His presence makes most of them uncomfortable even though he’s done nothing to set them off. Touko changes the rules about dating within a day of meeting Kakeru and this serves as the catalyst for character development and plot. Kakeru’s arrival ushers in the unsettling themes. For most slice-of-life anime, the plot and character development are driven by daily drama and, in more extreme scenarios, death and tragedy. Good examples of this genre are Toradora and Silver Spoon. 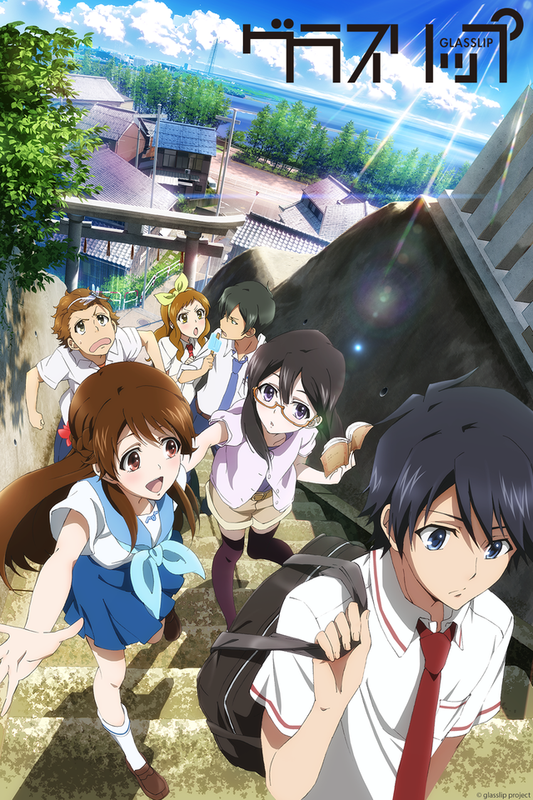 GlassLip, like Ano Hana and Waiting in the Summer, introduces uncommon themes to a very grounded genre. But it struggles to find its pace. It starts off slow, introduces mysterious elements, and then teeters between interesting and complacent. The “fragments of the future” that only Kakeru and Touko experience are sometimes unnerving. Without spoiling the series, it’s difficult to explain what they are. The closer their relationship, the more they can see and hear. Touko’s visions become stranger and more unsettling as the series progresses. Around episode six, I started wondering if GlassLip would start walking the line between drama and horror. It didn’t. Around that time, it felt like it wanted to be a romance anime too. It didn’t go that route either. GlassLip does do a good job developing the supporting cast. Touko’s friends are important to both the story and her character. Little hints regarding each of their relationships and back stories are planted along the way. So, if following the strange nuances of the “fragments” or Kakeru’s and Touko’s relationship wasn’t enough, there’s plenty of subplots to keep viewers interested. The story isn’t just about Kakeru and Touko. The series has a lot of parallels regarding how people “exist” and think. It’s a series full of stop-and-go stories about people who are either stuck in the past, hindered by the past, or dream about the future. Very few live in the present. As GlassLip drew to an end, it was apparent that many plot points would be left unresolved. This was a little disappointing. After the “fragments” were somewhat explained, I realized something important about GlassLip. I was in it for the mystery. But the real story wasn’t about that at all. It was about a summer full of love and change. Reflecting on the anime, if the “fragments” are removed, it’s a sweet summer story about a new boy who came to town and swept an unsuspecting girl off her feet. In this regard, it’s touching and a little bitter-sweet. The “fragments”, in the end, feel more like a “gimmick” than a necessary component to the series. Assuming all the plot points were resolved, would GlassLip have been as interesting without the “fragments”? I think so. There’s nothing wrong with having a hook that becomes secondary to character development and plot. But, without tactfully resolving this feature, viewers will feel disappointed when it becomes obsolete. This is GlassLip’s downfall. One thing I loved about GlassLip was the art and the soundtrack. Though there were a lot of still frames that reminded me of the unfinished footage from Attack on Titan, PA Works never disappoints in the visual department. According to the credits, they worked closely with a local glass studio for references. The attention to detail really paid off because the crafting scenes were beautiful. It’s this attention to detail that I love about PA Works. The classical music in the background felt like a driving force for the series – especially once Kakeru’s family comes into the picture. The piano and violin melodies were unique compared to the other anime soundtracks from this season. It gave the series a nearly timeless feel. GlassLip is a slow, methodical watch. It has some weirder moments where it feels like it wants move into the psychological thriller genre. But it never does. It doesn’t do anything groundbreaking or wrap up loose strings. The best part of the series, for me, was the animation and watching characters develop. Overall, GlassLip is hit-or-miss. I feel like it falls short compared to other anime of its genre. While it’s a decent watch, it isn’t gripping enough to be a must-see. For something along the same lines, Nagi no Asukara (another anime by PA Works released in 2014) handles plot, character development, and unique elements more tactfully.